Back pain is usual cause of muscular sprain and can generally be resolved over the period of time due to regular blood supply to and fro the muscles. This in turn can help supply necessary nutrients as well as proteins for healing. Thus, in spite of the fact that many episodes of back pain and lower back pain should heal with time, regardless of the treatment, the pain that last longer than three months, or patients with predominant leg pain and more specific definable problems for the pain should be sought. Even though back pain can affect people of any age, it is significantly more common among adults aged between 35 and 55 years. Researchers say that back pain is associated with the way our bones, muscles, and ligaments in our backs work together in coordination. 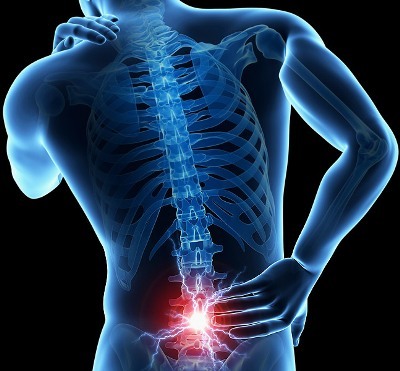 Pain in the lower back may be linked to the bony lumbar spine, discs between the vertebrae, ligaments around the spine, spinal cord and nerves, lower back muscles, abdomen and pelvic internal organs, and the skin around the lumbar area. Pain in the upper back can be attributed to disorders of the aorta, tumors in the chest, and spine inflammation, etc. Spinal osteoarthritis is a degenerative disorder that may result in loss of normal spinal structure and function. Although aging is the primary cause, the location and the rate of degeneration are very individualistic. The degenerative process may impact the cervical, thoracic, and/or lumbar regions of the spine affecting the discs and spinal joints. Osteoporosis normally affects the thoracic and thoracolumbar regions of the spine and may cause unbearable pain. This disorder is caused by a loss of bone mineral density ensuring fragile, brittle bones that are prone to easy fracture. Osteoporosis may cause vertebral compression fractures, loss of height, stooped posture, even a humped back. The patient can control some of the risks for osteoporosis. These include poor diet, smoking, excessive intake of alcohol, and inactivity. The term ‘sciatica’ is generally used to describe the pain that travels along the sciatic nerve, the largest nerve in the body. The pain may be sharp, dull, burning, or accompanied by intermittent shocks of shooting pain beginning in the buttock traveling downward into the back of the thigh and leg. The most common cause of sciatica is a herniated disc in the lumbar spine. A compression fracture is a common fracture of the spine that may range from mild to severe. Each vertebral body is separated from the other with a disc. When an external force is applied to the spine, such as a fall, carrying heavy weight, accident, trauma, etc. the forces may exceed the ability of the bone within the vertebral body to support the load. The fracture as a resultant of these external trauma are identified as compression fracture, whereas if the entire vertebral column breaks down then it is identified as burst fracture. Osteomyelitis is a bone infection usually caused by bacteria. In the spine, it is commonly found in the vertebrae, although the infection can spread into the epidural and/or intervertebral disc spaces. Typically, symptoms include persistent and severe back pain exacerbated by movement, swelling, fever, sweating, weight loss, and malaise. Spinal cord injury can be a devastating condition, causing damage or trauma to any parts of the spinal cord or nerves at the end of the spinal canal. This may bring permanent changes in the strength, sensation, and other body functions below the site of the injury. With the invention of stem cell therapy it is possible to use special regenerative cells (stem cells) to be repopulated in the areas of damage for further improvement in the ability to move (“motor outcomes”) and to feel (“sensory outcomes”) beyond the site of injury, thus providing aid in Spinal Cord Treatment.